As we said in issue 7, the Greater North is made up by the regions of Arica y Parinacota, Tarapaca and Antofagasta. 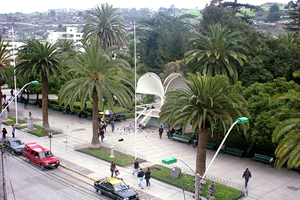 The Region of Arica y Parinacota is administratively divided into two provinces, Arica (the regional capital) and Parinacota. It is located between the 17º30′ and 19º14′ southern latitude points and from the 68º50′ meridian to the Pacific ocean. Therefore, its northern border is Peru, the southern border is the Region of Tarapaca, the eastern border is Bolivia and the western border is the Pacific ocean. It has a surface area of 16,873.3 km2 (which corresponds to 2.23% of Continental and Insular Chile). The Region of Tarapaca is split into two provinces: Iquique (the regional capital) and the province of Tamarugal. It is spread out between the 18º56′ and 21º36 southern latitude parallels and from the 68º24′ western meridian to the Pacific ocean. Therefore, its northern border is the Region of Arica y Parinacota, the southern border is the Region of Antofagasta, the eastern border is Bolivia and the western border is the Pacific Ocean. It has a surface area of 42,225.8 km2 (which corresponds to 5.58% of Continental and Insular Chile). The Region of Antofagasta is split into four provinces: Antofagasta (the capital), Mejillones, Sierra Gorda and Taltal. It is located between the 20º56′ and 26º05′ southern latitude parallels and from the 67º00 western meridian to the Pacific ocean. Its northern border is the Region of Tarapaca, the southern border is the Region of Atacama, to the east the border goes from the Chile-Bolivia border to the tri-border landmark of Zapaleri, with Argentina the border continues to Atalaya hill, and to the west the border is the Pacific ocean. It has 126,049.1 km2 of surface area (16.67% of Continental and Insular Chile). It is the second largest region after the Region of Magallanes y la Antartica Chilena.